The market finally recovered some ground after five back-to-back monthly losses, and my portfolio benefitted from the market's sudden enthusiasm too with a nice gain of 3.98%, the largest monthly gain in a while. Since my portfolio is decidedly under-exposed compared to my benchmark, my monthly gain is dwarfed by the benchmark's 4.45% expansion. On a year-to-date basis, both my portfolio and the benchmark lost about 3.30%. 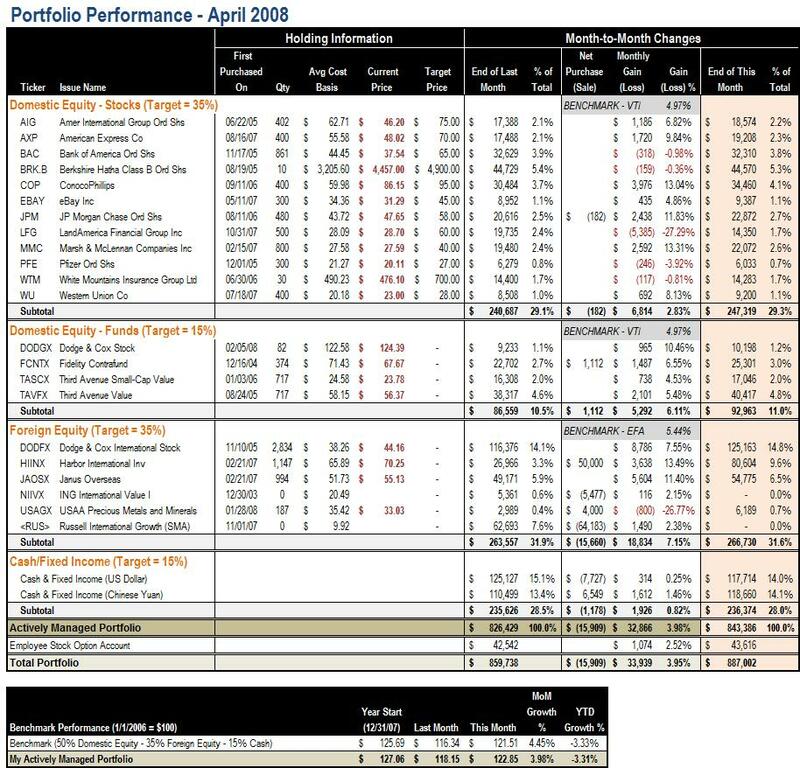 I made some shuffling in my mutual fund positions to embrace the newly available option of BrokerageLink -- a 401(k) plan feature that allows participants to expand investment options to almost all stocks and mutual funds. As such, I dropped Russell International Growth and ING International Value (NIIVX), bought more of Harbor International (HIINX) and USAA Precious Metals and Minerals (USAGX). Also, I had to pull some money out of my portfolio to repay some 0% APR credit card debt that is coming due. This, of course, reduced the leverage of my portfolio. I'm still somewhat pessimistic of the market: while we are enjoying a relatively long window of non-event (or, in other words, market expectation is so low that it is taking any not-too-bad news as good news), but there will be more mortgage interest rating coming up in the next two years, and the housing market is still sinking. So in general, I'm looking to fly to safety. It doesn't mean I won't add more to stocks or mutual funds, but I'm not feeling too bad of my 28% cash position now (which dragged the portfolio performance in a month like April). I also plan to move more money to the other side of the Pacific for some assured gain in this turbulent market. This Post Has Received 400 Comments. Share Your Opinions Too. Why would you sell the ING International Value Fund...that is sub-advised by Brandes of San Diego, California...they have been fantastic managers of foreign equity for over 30 years. The only fund that genuinely compares is Dodge & Cox International (DODFX)...can you buy that one in your BrokerageLink account? For the short term, moving US Dollars to Yuan will be profitable as the uptrend pressure on Yuan is strong due to escalating inflation in China. But I believe the greenback should strengthen towards the end of the year when the housing market stabilizes and interest rates move upwards. Exposure to agriculture and alternative energy is also a good idea at this point of time. My brother recommended I may like this blog. He used to be totally right. This put up actually made my day. You cann't imagine just how so much time I had spent for this info! Thank you! You need to take part in a contest for one of the most useful blogs on the net. I most certainly will highly recommend this website!